WHIZARD is a program system designed for the efficient calculation of multi-particle scattering cross sections and simulated event samples. Tree-level matrix elements are generated automatically for arbitrary partonic processes by using the Optimized Matrix Element Generator O'Mega. Matrix elements obtained by alternative methods (e.g., including loop corrections) may be interfaced as well. The program is able to calculate numerically stable signal and background cross sections and generate unweighted event samples with reasonable efficiency for processes with up to eight final-state particles; more particles are possible. For more particles, there is the option to generate processes as decay cascades including complete spin correlations. Different options for QCD parton showers are available. Polarization is treated exactly for both the initial and final states. Final-state quark or lepton flavors can be summed over automatically where needed. For hadron collider physics, an interface to the standard LHAPDF is provided. For Linear Collider physics, beamstrahlung (CIRCE) and ISR spectra are included for electrons and photons. The events can be written to file in standard formats, including ASCII, StdHEP, the Les Houches event format (LHEF), HepMC, or LCIO. These event files can then be hadronized. 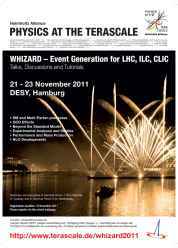 WHIZARD supports the Standard Model and a huge number of BSM models. Model extensions or completely different models can be added. There are also interfaces to FeynRules and SARAH. The distribution tarball of the sources can be found here (link). Nightly build tarballs can be downloaded: (link). Before installing WHIZARD, you should check the note on compilers and the page on possible build problems in the WHIZARD Wiki. The manual for WHIZARD 2 is not yet completed. We regularly update the version from the distributions (last update: 2019-03-27). The manual is available as PDF (link) and HTML (link). You can find a few physics examples in the WHIZARD Wiki. The documented WHIZARD source code can be found here (link). There is also a manual for GAMELAN, the graphics package based on MetaPost for WHIZARD's internal analyses. You may also want to inspect the latest news and the list of changes. MAC OS X MacPorts: WHIZARD is available for MAC OS X on MacPorts! MAC OS X Darwin >= 10.11: There is a known issue on Darwin >= 10.11 concerning the test suite. Confer the wiki for more information. Prerelease versions, alpha versions, patches, and unofficial versions might be found here (link). Service for archaeologists and regression testers: old sources are kept here (link) and here (link). Zhijie Zhao (U. Siegen) : NLO QCD, pp physics, higher-dim. operators. 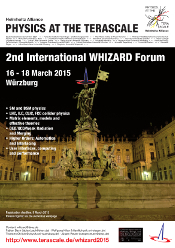 The WHIZARD project is a part of the Strategic Helmholtz Alliance Physics at the Terascale. We are furthermore supported or have been supported in earlier stages of this work by the German Bundesministerium für Bildung und Forschung (BMBF), the German Deutsche Forschungsgemeinschaft (DFG), and the Ministerium für Wissenschaft und Kultur (MWK) of the state Baden-Württemberg. M. Moretti, T. Ohl, J. Reuter, O'Mega: An Optimizing matrix element generator , LC-TOOL-2001-040-rev, arXiv: hep-ph/0102195-rev. W. Kilian, WHIZARD Manual 1.0, LC-TOOL-2001-039, http://www-flc.desy.de/lcnotes/. This document is identical to the manual of version 1.0. You can also access our subversion repository at http://whizard.hepforge.org/svn/trunk for checking out (pun intended!) the current sources. Note, that the svn contains the latest developer version. In order to be able to compile the svn version, one has to first generate the configure.ac by executing the shell script build_master.sh, then generate the configure script out of the file configure.ac by running autoreconf (NOT autoconf) which is part of the autoconf/automake http://www.gnu.org/software/autoconf and http://www.gnu.org/software/automake package. Furthermore, the development version also needs the noweb tools to be installed on the system in order to extract the source codes and documentation from several so called .nw files. The noweb package can be downloaded and installed from here: http://www.cs.tufts.edu/~nr/noweb . A standard reference of SM ILC cross sections can be found here. A standard reference of SUSY cross sections can be found here. WHIZARD 1: The sources for version 1.97 can be found here. Note that with version 1.94 the development of new features in version 1 stops; there will be only bug fixes from now on. Look at this link for installation instructions. The manual is available in HTML and in PostScript and PDF formats. This WWW page is brought to you by Wolfgang Kilian, Jürgen Reuter, and Thorsten Ohl.